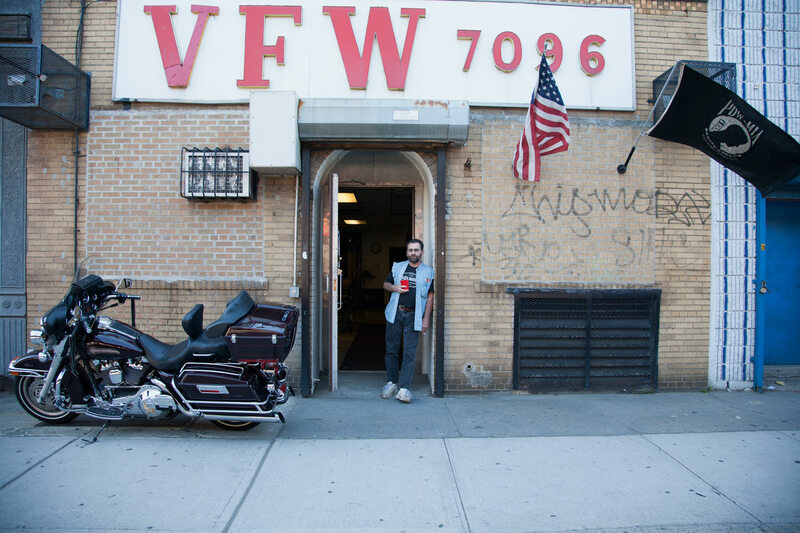 There were many days back when I lived in Sunset Park, Brooklyn and walked to the local fruit market that I would pass the hulking steel door of VFW 7096 (veterans of foreign wars). For longer than I care to admit, I had wanted to see what was behind that door but the huge Harley Davidson, POW flags and general look of the place intimidated me from knocking. One hot summer day on my walk to the fruit market I saw that the door was cracked open. It was now or never I figured and proceeded to poke my head in. I was first greeted by the smell of stale cigarettes and booze but soon a man introduced himself as Kenny Dunn the post commander. I introduced myself and explained that I had walked by many times but lacked the courage to knock. He laughed and said I was welcome. Over the next couple of years I would stop by from time to time. Sometimes I would photograph and sometimes I would just say hi. I met many veterans over the years ranging from WW2, Korea, Vietnam and the Gulf War. They always greeted each other as brothers and I really felt the love and respect that they shared. Of course, each felt that their war was the toughest. I’ve read that the place, which was somewhat, dilapidated and beat up looking, has had a makeover. I’ve not been back in a number of years but I often think of the courage of those who represented their country. It takes a special person to sign up and fight. I can’t think of a reason why laws are being put in place to stop some from doing just that. I used to walk past a giant steel door on my way to the fruit store when for a few years I lived in Sunset Park Brooklyn. The door was the entrance to a VFW 7091 (Veterans Of Foreign Wars) For months I had wanted to knock but was simply intimidated. It was not only the steel door but also the huge Harley out front and the POW flags on the wall. One summer day that door was slightly cracked open, I poked my head in and was greeted with the smell of old cigarettes and booze. Inside a man introduced himself as the post commander. I introduced myself and explained that I had walked by many times but had never had the courage to come in. I spent the next year or so getting to know the men of VFW post 7091. Often times the place seemed more like a bar than a post to get together and hang out. I met men who fought in WW2, Korea, Viet-Nam and the Gulf War. Funny how many of them felt that their battles were tougher than the other vets. Sometimes I think of the courage I lacked to simply knock on that steel door and the courage all of those men had in order to fight for and represent their country in war. There were many days back when I lived in Sunset Park, Brooklyn and walked to the local fruit market that I would pass the hulking steel door of VFW 7096 (veterans of foreign wars). For longer than I care to admit, I had wanted to see what was behind that door but the huge Harley Davidson, POW flags and general look of the place intimidated me from knocking. One hot summer day on my walk to the fruit market I saw that the door was cracked open. It was now or never I figured and proceeded to poke my head in. I was first greeted by the smell of stale cigarettes and booze but soon a man introduced himself as Kenny Dunn the post commander. I introduced myself and explained that I had walked by many times but lacked the courage to knock. He laughed and said I was welcome. Over the next couple of years I would stop by from time to time. Sometimes I would photograph and sometimes I would just say hi. I met many veterans over the years ranging from WW2, Korea, Vietnam and the Gulf War. They always greeted each other as brothers and I really felt the love and respect that they shared. Of course, each felt that their war was the toughest. I’ve read that the place, which was somewhat, dilapidated and beat up looking, has had a makeover. I’ve not been back in a number of years but I often think of the courage of those who represented their country. It takes a special person to sign up and fight. I can’t think of a reason why laws are being put in place to stop some from doing just that. I used to walk past a giant steel door on my way to the fruit store when for a few years I lived in Sunset Park Brooklyn. The door was the entrance to a VFW 7091 (Veterans Of Foreign Wars) For months I had wanted to knock but was simply intimidated. It was not only the steel door but also the huge Harley out front and the POW flags on the wall. One summer day that door was slightly cracked open, I poked my head in and was greeted with the smell of old cigarettes and booze. Inside a man introduced himself as the post commander. I introduced myself and explained that I had walked by many times but had never had the courage to come in. 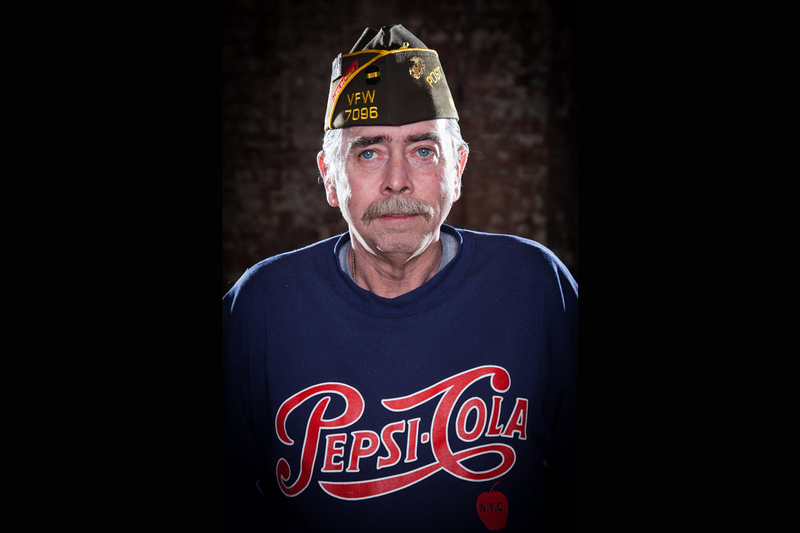 I spent the next year or so getting to know the men of VFW post 7091. 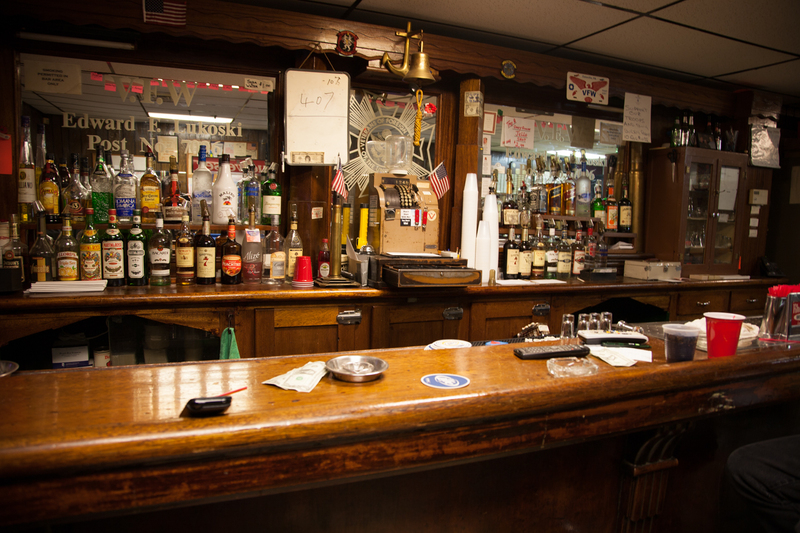 Often times the place seemed more like a bar than a post to get together and hang out. I met men who fought in WW2, Korea, Viet-Nam and the Gulf War. Funny how many of them felt that their battles were tougher than the other vets. Sometimes I think of the courage I lacked to simply knock on that steel door and the courage all of those men had in order to fight for and represent their country in war.